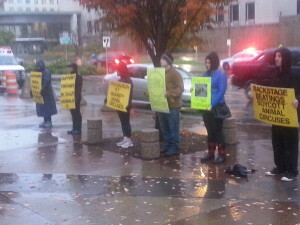 Thanks to everyone who came out to stand up in our YellowWall for animals exploited in the circus: Martha S., Carol H., John V., Beth G.B., and four non-members. Rochester treated us to cold temperatures, pouring rain, and high winds, sometimes at the same time!, so these folks are especially hardy. A special hoop-hollering thank-you to Mary for leading half the shows. And I’d like to thank additional people who came out to “do their own thing” by walking around with their own signs or handing out flyers, including our own Kathy C.
… and sometimes it’s like this. Thanks, Carol H, you came to more than half the shows including three on one day! You may be interested to know I estimate that there were about 500 attendees at each show except Sunday afternoon, which might have been 1,000. This in a stadium which holds 13,000. That puts total attendance around 4,500. 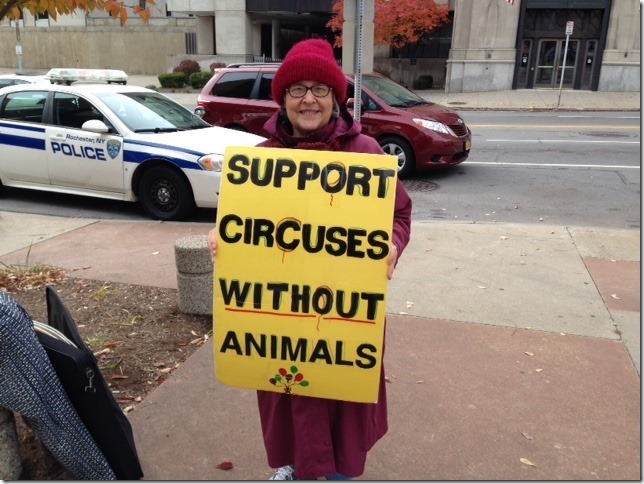 One man came up to me while I held my “Backstage Beatings – Boycott Circuses with Animals” sign to point out smugly “There’re a lot of people not boycotting the circus.” But not really – even if you only count Rochester (2013 pop. 210,000), only 2% of the population went to the circus. If you count greater Rochester (the county, pop. 750,000), it’s a mere half a percent. 99.5% of Monroe County skipped Ringling Circus. And now the other 4,500 have something to think about.